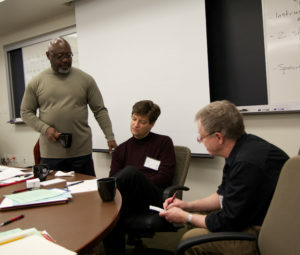 This conference gathered the representatives from five doctoral programs that received grants in 2012 to meet with recently graduated doctoral students for structured feedback and conversation on their preparation by the doctoral program for their careers as teachers. 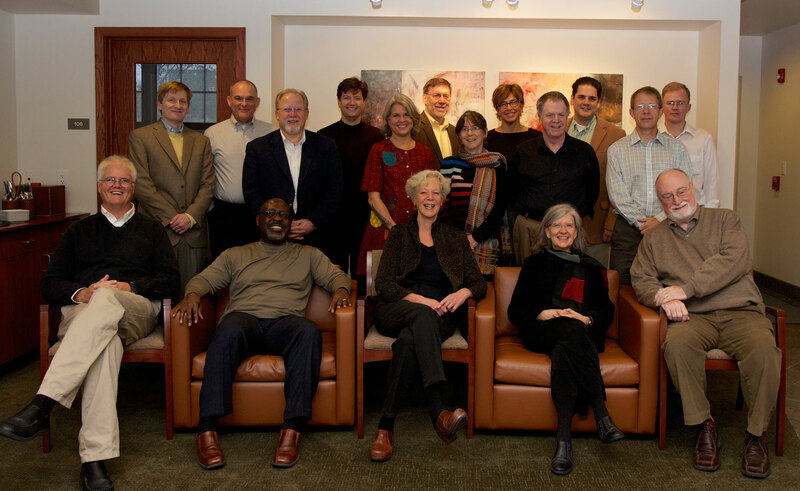 Front Row (left to right): Tom Pearson (Wabash Center), Willie James Jennings (Duke Divinity School), Nadine Pence (Wabash Center), Patricia O’Connell Killen (Gonzaga University), Eugene Gallagher (Connecticut College). Second Row: Rhyne Putman (New Orleans Baptist Theological Seminary), Jeffrey Riley (New Orleans Baptist Theological Seminary), Virgina Burrus (Drew University), Ross Kraemer (Brown University), James Keenan (Boston College), Paul Myhre (Wabash Center). Third Row: Charles Ray (New Orleans Baptist Theological Seminary), Thomas Lewis (Brown University), Rick Gaillardetz (Boston College), Catherine Cornille (Boston College), Robert Miller (The Catholic University of America), David Bosworth (The Catholic University of America).